Employed Youth Ministers/Christian Youth workers only deployed where there are Churches with significant financial resources (with a small number of exceptions), meaning deployment is based on money not need. Volunteers who are so committed but the Church doesn’t always seem to recognize their work as a ministry and therefore insufficiently affirms and finances it. (Many volunteers also take on too many “proper” ministries in the Church as well, lessening the time they have to work effectively with young people). That even really good youth ministry happens away from the main body/community of the Church. Even where young people are discipled well, it is into the youth ministry and not into the life and mission of the Church. The Church is reluctant to change sufficiently to genuinely include the young people. With many churches completely disengaged from young people or (and I hate this phrase) “holding on” to a few, where are the points of contact with young people? How to churches re-engage with community and young people? Youth ministry is doing a fantastic job of enabling and creating community that young people can be a part of. Youth Ministry is an awesome place for young people to experience peer and significant adult friendship. To find what it means to be accepted, believed in and to really belong. 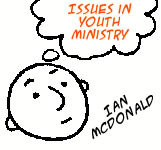 Youth Ministry provides a place to explore, question and to be listened to. Youth ministry is a place where it’s OK, in fact great, to be an adolescent in a culture that doesn’t seem to like young people very much. Youth ministry allows young people to encounter Adults (and young people) who seek to live a 24/7 faith and model a life that’s Christ centered and counter cultural. More listening to and less “talking at” young people. Become much more about encountering God than being taught facts about him. Giving opportunity to live faith not just hear about it. Be less driven/ruled by programme. Model an alternative to materialistic consumerism. For the young people to be more connected into the main body and mission of the church and for them to be given chance to explore their gifts. There is still too stereotypical an idea of what a youth minister/leader should be, people of any age and personality can (and do) make a difference to young people and share their lives and faith. Ian Mcdonald is a youth minister in England working for the Diocese of Oxford. His site, Youthblog, gives a snap shot of the issues as he sees them in the U.K. context.